Ever been frustrated with slow betting experience on ethereum? Ever wish to have proper crypto-gaming with smooth graphics? Got a few moments to spare on casual games with a ridiculous theme? CryptoSpin is now in available on the Ethereum mainnet. 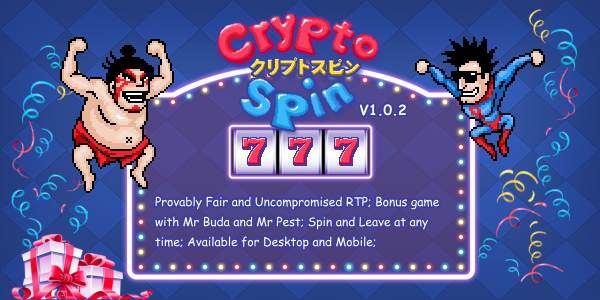 Unlike other slot games using cryptocurrencies, CryptoSpin delivers to you a smooth and unified spinning experience by employing HTML5 canvas and cutting edge graphics acceleration technologies. Hold your breath when you encounter Mr Buda in our bonus game, and testify our RTP. Good Luck! Visit www.cryptospin.co today and earn REAL ETHER! Stay tuned and be sure to join our social media (Discord, Reddit, Twitter) to get more updates.